When it's time to buy an Iberico ham for a Christmas party or other celebration, we often realize that we don't quite know the difference between a shoulder and an Iberico ham. What's the best choice and why are they different? Find out below. The differences between the two products may seem subtle if you're unfamiliar with the world of Spanish ham, since both products are made in a similar way. However, for experts and lovers of this delicacy, there are considerable differences between shoulder and Iberico ham. Each has distinct characteristics, differing in flavor, appearance, texture and aroma, so it's good to know what you're shopping for so you can match your purchase to your needs and tastes. The Iberico pig is a quadrapedal animal with large, strong forelegs that can also be used for meat, just like the hind legs. The cured front leg is shoulder, while the cured rear leg is ham. However, this is the source of one of the major differences between Iberico ham and shoulder, since the forelegs are both shorter and slighter than the back legs. As a result, shoulder tends to be smaller than Iberico ham. This is in itself a difference that means substantial alterations in weight, size, number of bones and therefore the distribution and quality of the meat. A foreleg is not just "a back leg at the front": there are big anatomical differences that result in a different piece of meat. For instance a Spanish ham will typically measure between 70 and 90cm hoof to tip, while a shoulder usually is between about 60 and 75cm. Spanish hams are usually also wider. Another difference between shoulder and Iberico ham has to do with the shape and arrangement of bones. The shoulder is easily recognizable because it contains the distinctively-shaped shoulder blade (the 'palette' that gives it its Spanish name, 'paletilla'), which occupies a larger area than the bones in the rear leg. These are characteristically smaller and differently-shaped. The differences described above are important, but what we're really interested in is the organoleptic qualities of an Iberico ham or a shoulder: flavor, texture, aroma, color. These in fact form the main differences between shoulder and Iberico ham. Many experts agree that Iberico shoulder is a tastier meat than Iberico ham in some ways, partly due to a greater amount of intramuscular fat and partly due to a shorter cure that results in a 'younger' flavor. However, it's also typically a less mature, intricate and nuanced flavor than the famously subtle Iberico ham. 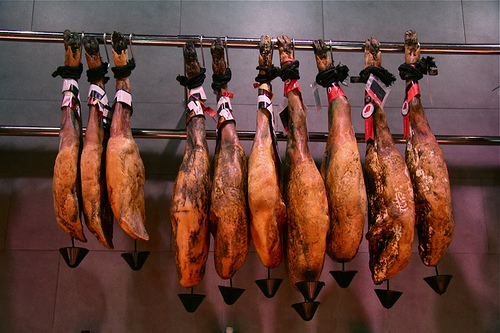 Typically an Iberico ham will develop deeper, richer flavors during a longer cure. We can expect to find that the flavors originally present in the meat have mellowed and intermingled during the curing process. The shoulder's shorter cure results in a more intense but less subtle flavor. While this isn't immediately clear when you read it, your palate will know the difference, so don't miss the chance to taste and compare the two! 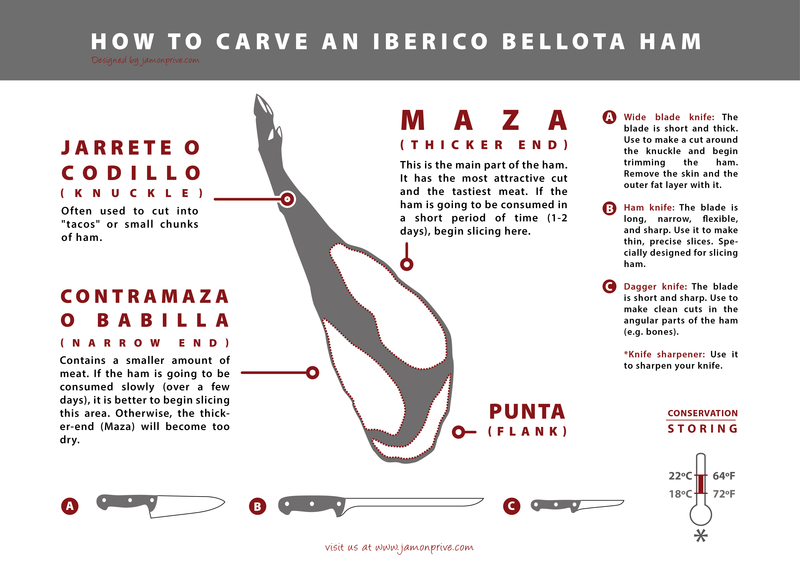 Obviously, these are factors to consider when you're buying an Iberico ham or shoulder. Beyond the differences between shoulder and Iberico ham that result in different flavors, which are subjective and ultimately depend on the taste of the consumer as much as the taste of the Iberico ham, there are several other matters to consider. One is the pocketbook: If you're looking for an Iberico product ham is more expensive than shoulder because it requires more time to produce. A general rule is that a kilo of Iberico ham will cost about twice as much as a kilo of shoulder, but this needs some qualification. In fact, if we're talking about products from animals with the same degree of breed purity - 100% Iberico, say - and that have been reared and fattened on a similar feeding regime, there will be a significant difference in weight between an Iberico ham and a shoulder. 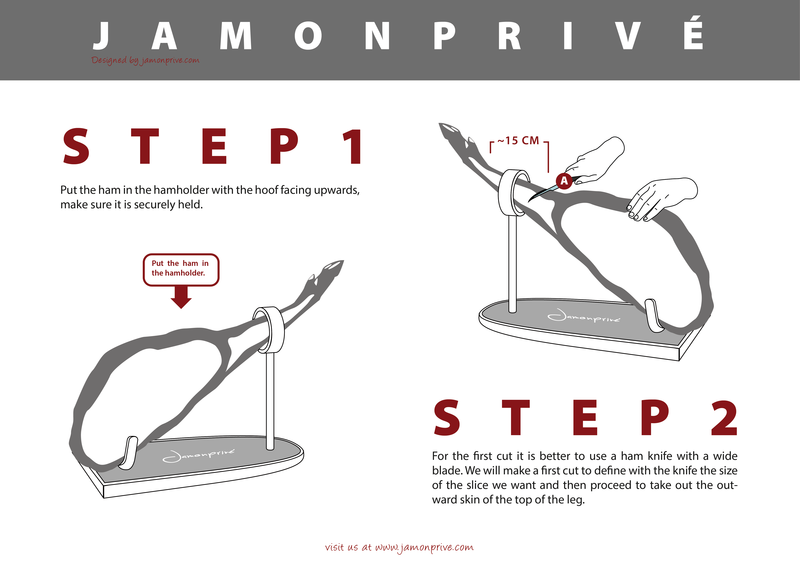 Overall, Iberico hams typically weigh about 7.5kg while shoulders are usually closer to 5kg. Not only are shoulders lighter, they're bonier too, thanks to the shoulder blade, which results in a smaller proportion of meat as well as a smaller product overall. This makes them an ideal choice for a specific time when the whole product will be consumed at once, like a family occasion. If you're hoping to get several parties out of your Iberico purchase, or you're looking for something you can consume slowly at home, an Iberico ham might be a better purchase. Regardless of the differences between Iberico ham and shoulder, the real decisive question is: which do you like? Individual taste is the final barometer, so test both and decide for yourself!